File Recovery for Excel (DiskInternals Excel Recovery) is designed to find and recover Microsoft Excel spreadsheet document files safely and securely, regardless of how badly the hard drive or the file system is damaged. If an Excel file has been accidentally deleted, File Recovery for Excel will find all Excel files that were deleted recently, and test each file for the possibility of successful recovery. In cases where the hard drive crashed or the file system is corrupt, File Recovery for Excel will scan the entire hard drive's surface in order to locate Microsoft Excel spreadsheets that aren't marked in the file system. The process uses a list of signatures associated with Microsoft file formats in order to detect precisely the beginning and end of each and every Microsoft Excel spreadsheet on the hard disk then extract and validate their content and metadata on the fly. This method works even on disks that are completely inaccessible in Windows. 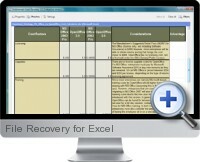 File Recovery for Excel matches the results obtained with the file system scan against those obtained by scanning surface of the hard disk, and displays the complete list of recoverable Excel spreadsheets along with their file names, metadata and contents, giving the best possibility of successful recovery. To recover the latest version of an Excel spreadsheet, a special "on the fly" mode allows to only show Excel files with specific title, created by specific author, or the files that contain certain text, are of a certain size, or are last saved on a specific date. File Recovery for Excel works on all versions of Windows, and supports all versions of Microsoft Excel, including Excel 97, 2000, XP, 2003, 2007 and 2010.